Victims who were burned by Samsung Galaxy Note7 devices that overheated or exploded won't soon forget, but Samsung clearly wants to move beyond the disaster and the recall of all 3 million of its Note7 smartphones. After months of investigations, the South Korean company on Monday formally blamed short-circuiting in batteries by two battery manufacturers as the cause for overheating. In some cases, batteries were missing insulating tape around battery components or electrodes were damaged and bent. Some welding defects in some of the second wave of batteries by a different battery maker also caused short-circuiting. Samsung's inquiry found that Note7 hardware and software features like fast charging and a new iris scanner had no impact on the overheating. More than 700 engineers and researchers tested 200,000 Note7 phones and 30,000 phone batteries. Around 96% of all 3 million Note7s sold have been returned. Despite the findings about the batteries, Samsung hasn't said whether it will use another battery manufacturer for future phones. Samsung SDI supplied the original Note7 batteries, according to several analysts and reports. After the first round of overheating problems surfaced, Samsung turned to Amperex Techology for batteries, although some of those also led to overheating problems. As recently as December, Samsung was reportedly in talks with LG Chem to produce battery cells for the upcoming Samsung Galaxy Note8 and possibly other phone models. Samsung couldn't be reached for comment. "I would not recommend Samsung make radical changes just for the sake of a public flogging of their [battery] partner," Samsung SDI, said Werner Goertz, an analyst at Gartner, in an email. "Samsung SDI has been at the forefront of innovation when it comes to lithium-ion chemistries." Samsung is announcing its fourth-quarter results on Tuesday. The company already said it expects to see profits rise by 50%, largely due to growth in its components business, while revenues will remain the same as the previous fourth quarter. Those results are vastly different from what Samsung reported in the third quarter, when its mobile division revenue dropped 15% and profits dived 95% because of the Note7 recall. 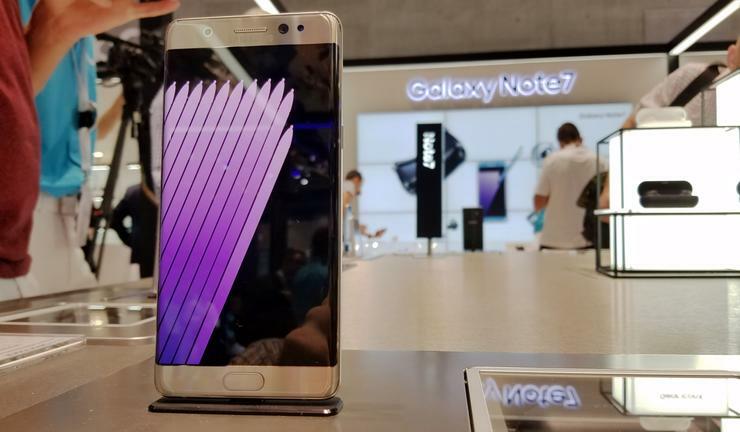 Patrick Moorhead, an analyst at Moor Insights & Strategy, said by email that most of the general public in the U.S. and Europe, and even South Asia, will feel the Note7 overheating episode has "blown over completely." Buyers in China might still need convincing, however, he added. "Based on what Samsung disclosed on the Note7 Monday, that probably convinced people that its 8-step battery safety check and special software algorithms will make future phones safer," he added. Samsung's new battery safety check will include x-ray testing to see inside a battery for any abnormalities, as well as look for changes in voltage throughout components as well as in assembled devices. New brackets will also be added around batteries for greater protection and new software will govern a battery's charging temperature, current and charging duration. Delays for the Galaxy S8? The Note7 debacle has led to rumors that Samsung will delay its announcement of the Galaxy S8 smartphone until April. For the past three years, the company has announced its next-generation Galaxy phone at the Mobile World Congress (MWC) trade show in late February. "I'm still expecting a new S8 at MWC, but if they can't ship it until May or June, then they will likely move out the announcement a few months," Moorhead said. "I've heard the rumors [about delays] but I sincerely hope that the Galaxy S8 will follow its regular announcement cadence there," Gartner's Goertz said. "Samsung learned a very tough lesson in the aftermath of the first recall, that you cannot rush a product to market if not sufficiently tested," Goertz added. "Samsung will forever be cautious about rushing immature products to market, and the rest of the industry should take heed of this as well, including Chinese manufacturers." Ramon Llamas, an analyst at IDC, said Samsung's investigation of the Note7 answers what happened and why. "That was a good step, but having said that, this is not over," he said in a telephone interview. "The 8-step review is fine, but do they have a process in place should this problem of overheating phones rear its ugly head again?" Llamas added. "If the batteries were to blame, let's not pull that lever again and use that maker's batteries again." Llamas said that he was encouraged that Samsung apologized for the overheating Note7s, although he predicted lawsuits by burn victims and that Samsung will likely settle them quietly and out of public view. In the U.S., Samsung received 96 reports of overheating Note7s, with 13 reports of burns and 47 reports of property damage. "There's no such thing as apologizing too much," Llamas said. "I'm sure Samsung is taking responsibility, but we probably won't see what reparations are made to some of the victims." With Samsung's next top-tier smartphone, the Galaxy S8, Samsung will need to offer exciting new features that will attract buyers who can hopefully overlook the Note7's battery problems. "For the next Samsung Galaxy S8. . . I'd like problem-free batteries for starters, although that's kind of tongue-in-cheek," Llamas said. "Still, at a minimum, people expect their phones to be safe." Llamas said he expects Samsung's S8 to pay attention to a better personal assistant, such as the Pixel phone's Google Assistant. Several reports have rumored that Samsung will offer a new digital assistant trademarked as "Bixby" to add powerful features to the S8, going beyond Google Assistant and Samsung's own S-Voice. "Samsung's S-Voice is lagging and the Samsung Viv acquisition should boost voice capabilities on their devices," Geortz said. "I hope to see Samsung join the ranks of Alexa and Google Assistant." Moorhead said he expects a "ton of improvements in the S8" that could help buyers forget the Note7 problems. He said Samsung should offer a number improvements: A dual-lens camera; an edge-to-edge display; Wi-Gig capabilities for 10 times the speed of current Wi-Fi; a Snapdragon 835 processor for 20% faster CPU performance and better battery life; and a new fingerprint reader that lets a user touch the display instead of requiring a dedicated hardware button. But even with big improvements in the Galaxy S8, Geortz warned that the Note7 overheating problem is not truly put to rest. "Samsung still has many years of work ahead to recover the lost consumer and brand perception of quality-first and technology innovation," he said. "This road will be long."